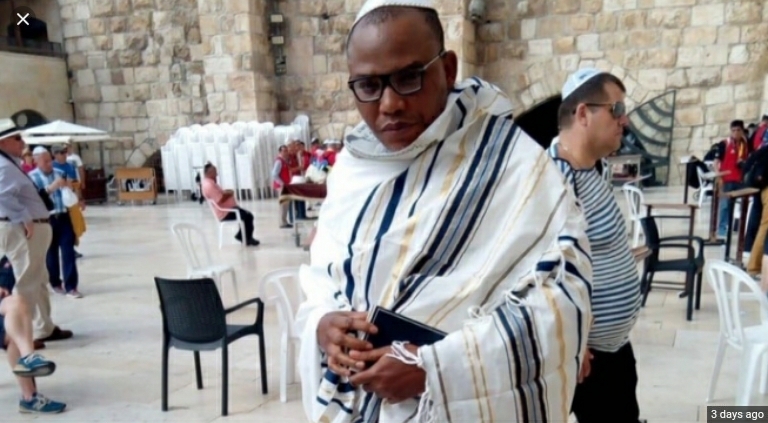 An Open Letter To Nnamdi Kanu. With all due respect, I wish to express my disappointment at your abysmal broadcast yesterday. I am still at a loss why many Igbo still fight and die for a leader like you, so insensitive and a braggart. During the Python dance operation, many Igbo families were wrecked – sons were executed point blank, tortured terribly and maimed, then you resurface after some months after being spotted in Israel to mourn the death of “Jack my dog and many others”. That was unfair, insensitive and prideful of you. Mazi, I expected you to shed tears at the mention of humans, people’s children who followed you at the peril of their lives. I expected you to inform the Igbo that you are fine. I expected you to massively thank them for their loyalty, prayer and support, and not assure them of your return with “hell”. What about your handlers giving the full names of the thirty killed and you will slowly mention them one after another, and speaking words of comfort to their families. Is it took much to do? Who is Jack? Who is his father? Does he even have a soul? You are not a leader. Ojukwu did not do this after he escaped to Ivory Coast. You are too insensitive to be one. I see no emotions in you for your people. When Ojukwu was here, he mostly addressed the Igbo with an emotionally laden tone, full of tenderness and compassion. People went home comforted. You only come to stir the beehive and shut out the world all of a sudden, leaving your Igbo kinsmen to get at each other’s necks. You are not a leader, truth be told. You don’t speak the minds of the Igbo. Maybe of ndi Abia state, but certainly not of Ndigbo. You are not my leader. You are no longer Nigerian, as you stated. Stay out and remain out. The hatred for the Igbo aggravates daily because of braggarts like you. We work and sacrifice in Nigeria like elephants and survive like ants. You have nothing to offer any Igbo. Your wife and kids are safely tucked in the UK but you always have a way of showing up to bastardize the little goodwill we manage to have here. Leave us alone. We are suffering greatly over here. Unfortunately most of your ardent supporters live in diaspora and have no single idea what it means to struggle to survive over here. We are suffering, Mazi. We are groaning under a huge yoke that cannot be lifted by the rudeness and profligacy that you exhibit in your pomposity. Enough. The Igbo are worried about your Dad and other members of your family. You couldn’t mention that in your broadcast. You think we are not genuinely worried about the welfare of your family? Go to UK, that’s where your citizenship is. Stop disrupting the peace of a country you have no business with. Create your dream country where you are and keep the “hell” there. I am sure Israel will be so generous to. You have mentored very rude, recalcitrant and cantankerous Igbo young men and women, strutting the social media and fighting and denigrating anyone that tries to reason with a head. What evil is this? You are on exile in Israel. Fine. Remain there and make the best of your time and opportunity. If your actions are found lethal, Israel may have no other option than to discontinue with hosting you. In Nigeria, you abused your bail conditions and trifled the integrity of all who were your guarantors. For your cause, Igbo suffer more in their host states. This is the much hardship your outlandish decisions have brought. If you truly love the Igbo, stay silent at the moment. If you cannot work with the who-is-who in Igboland, your patriotism is dung. If indeed, the APC government has not contracted you to destabilize the opposition as many insinuate now, Mazi kindly remain mum. Your integrity is going downward. You cannot clamour to deliver people who no longer see your goodwill as it is. IPOB members are mostly not registered voters, you didn’t need to announce that they should not vote. Ife dike gha eme di ye n’obi. Learn to be frugal with words. I wish you a safe stay in Israel. Mulu anya ka azu, jide onu ghu aka. Deeme, odogwu IPOB. Previous Faction of IPOB Sacks Nnamdi Kanu. Next Atiku-Tinubu Re-Union For 2019, Goodbye Buhari.